Monster Energy Honda Team disputed three races in the August and occupied top spot on the podium in two of them. In the most recent – the Desafío Ruta 40 – Kevin Benavides and Paulo Gonçalves finished in positions one and two. Meanwhile, it’s game on in the world championship as the leader board tightens . Monster Energy Honda Team is once again proving to be the team to beat in any of the races that the squad participates in. August saw a packed agenda with three rallies, with the team triumphing in two. 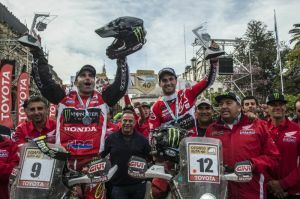 The other – the Atacama Rally – finished with the duo of Benavides and Gonçalves in second and third place. The team made off with a splendid win in the Vegas to Reno race thanks to the work of riders Joan Barreda and Ricky Brabec. Then it was on to one of the key Dakar preparation races – Argentina’s Desafío Ruta 40 – where Kevin Benavides replicated his victory of last year’s event. With Kevin Benavides’ two stage victories, plus one each for Paulo Gonçalves and Michael Metge, Monster Energy Honda Team incontestably dominated the fourth round of the FIM Cross-Country Rally World Championship. The team is right back in the fray for the world championship title. The enigma will be resolved in the Morocco Rally to be held at the beginning of October. Joan Barreda suffered a fall and injured his left forearm in a training session with the Monster Energy Honda Team one day prior to start of the Challenge Route 40. Both the rider and team decided that the best thing for Barreda would be to not participate in the race to avoid the likelihood of greater damage. Joan returned to Spain to undergo a cleansing of the affected area. The recovery period is expected to be about four weeks and he should be back for scheduled team testing in Morocco in September.